Environment friendly with long battery life, this blue colored 10400 mAh power bank presented to you by EverBest will become your favourite instantly. 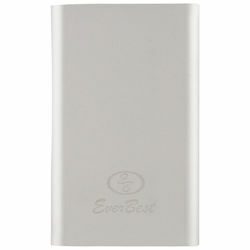 Supplied with dual USB output, it is compatible with most phones and tablets. Compact in size, you can carry it conveniently in your backpack or suitcase while travelling. The Li-Polymer Battery extends music time up to two hundred hours and talk time up to thirty six hours that makes it a great pick for a person who is tech savvy. Environment friendly with long battery life, this blue colored 10400 mAh power bank presented to you by EverBest will become your favourite instantly. Supplied with dual USB output, it is compatible with most phones and tablets. Compact in size, you can carry it conveniently in your backpack or suitcase while travelling. The Li-Polymer Battery extends music time up to two hundred hours and talk time up to thirty six hours that makes it a great pick for a person who is tech savvy.